Wente Vineyards is definitely one of our favorite locations in the Livermore Valley wine country. This particular wedding was an amazing experience and we actually had the honor of covering their wedding 2 times! They first had a civil ceremony at San Francisco city hall and then less than a year later held this large wedding at Wente Vineyards. This was perfect for us as wedding photographers because we had substantial experience at this venue with over 10 marriages photographed here over the years. This background helped us know where to take the newlyweds for their pictures after the ceremony. The image above is actually in the Cellar room which is a wonderful place to take wedding photos. Not everyone knows about this cellar room and you have to have permission to go in. 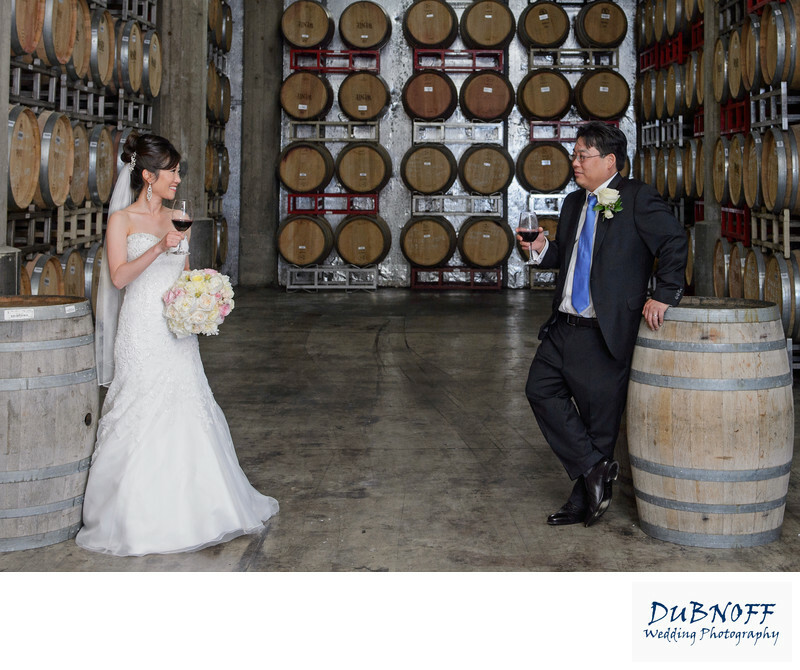 In addition, you need to know to ASK to bring the couple into the cellar because it is not always offered. However, the staff at Wente is very accommodating and will normally grant the request as long as there are no current events occurring at the time. We were quite lucky because they had just completed a clean up from a prior event and so we were allowed to enter and take pictures for the bride and groom.